Click here to find the same tutorial as below but for data from New York City, US. In this tutorial you will use a model SOlar and LongWave Environmental Irradiance Geometry model (SOLWEIG) to estimate the mean radiant temperature (Tmrt). SOLWEIG is a model that simulates spatial variations of 3D radiation fluxes and the Tmrt in complex urban settings. It is also able to model spatial variations of shadow patterns. Tmrt is one of the key meteorological variables governing human energy balance and the thermal comfort of people. It is derived from summing all the radiative (shortwave and longwave) fluxes (both direct and reflected) to which the human body is exposed. In SOLWEIG, Tmrt is derived by modelling shortwave and longwave radiation fluxes in six directions (upward, downward and from the four cardinal points) and angular factors. The model requires meteorological forcing data (global shortwave radiation (Kdown), air temperature (Ta), relative humidity (RH)), urban geometry (DSMs), and geographic information (latitude, longitude and elevation). To determine Tmrt, continuous maps of sky view factors are required. Both vegetation and ground cover information can be added to increase the accuracy of the model output. Below a schematic flowchart of SOLWEIG in shown. The full manual provides more detail. To introduce SOLWEIG and how to run the model within UMEP (Urban Multi-scale Environmental Predictor). Help with Abbreviations can be found here. Download, extract and add the raster layers (DSM, CDSM, DEM and land cover) from the Goteborg folder into a new QGIS session (see below). 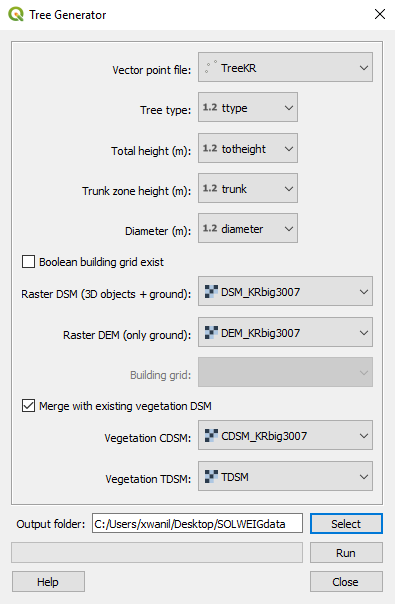 Examine the geodata by adding the layers (DSM_KRbig, CDSM_KRbig, DEM_KRbig and landcover) to your project (*Layer > Add Layer > Add Raster Layer). Examine the different datasets before you move on. To add a legend to the land cover raster you can load landcoverstyle.qml found in the test dataset. Right click on the land cover (Properties -> Style (lower left) -> Load Style). Details of the model inputs and outputs are provided in the SOLWEIG manual. As this tutorial is concerned with a simple application only the most critical parameters are used. Many other parameters can be modified to more appropriate values if applicable. The table below provides an overview of the parameters that can be modified in the Simple application of SOLWEIG. Digital elevation model (DEM) High resolution surface model of the ground R* S R* if land cover is absent to identify buildings. Given in m asl. Must be same resolution as the DSM. Digital canopy surface model (CDSM) High resolution surface model of 3D vegetation O S Given in metres above ground level (m agl). Must be same resolution as the DSM. Digital trunk zone surface model (TDSM) High resolution surface model of trunk zone heights (underneath tree canopy) O S Given in m agl. Must be same resolution as the DSM. UMEP formatted meteorological data Meteorological data from one nearby observation station, preferably at 1-2 m above ground. R M Any time resolution can be given. UTC (h) Time zone R O Influences solar related calculations. Set in the interface of the model. Human exposure parameters Absorption of radiation and posture R O Set in the interface of the model. Environmental parameters e.g. albedos and emissivites of surrounding urban fabrics R O Set in the interface of the model. 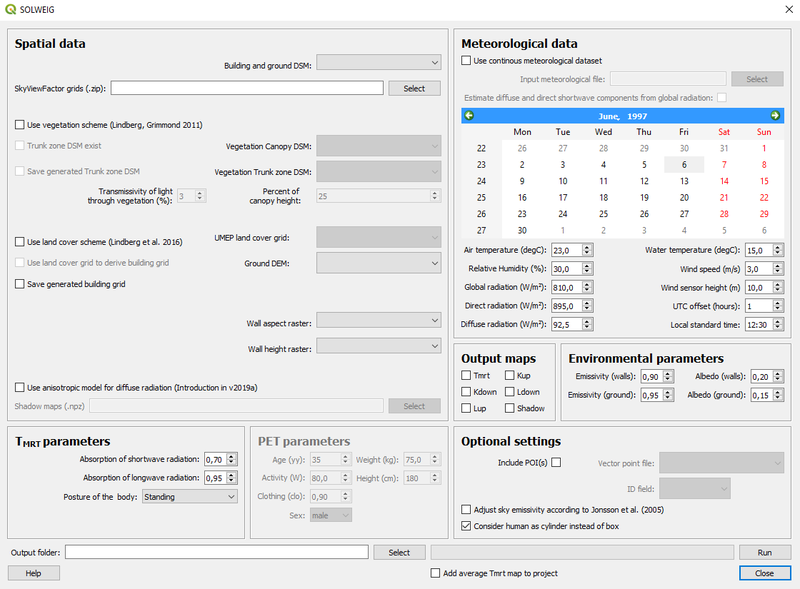 Meterological input data should be in UMEP format. You can use the Meterological Preprocessor to prepare your input data. There is also a possibility to use a single point in time in the plugin. The model performance will increase if also diffure and direct beam solar radiation is available but the mdoel can also calculate these variables. Open SOLWEIG from UMEP -> Processor -> Outdoor Thermal Comfort -> Mean radiant temperature (SOLWEIG). Some additional information about the plugin is found in the lower left window. You will make use of a test dataset from observations for Gothenburg, Sweden. To be able to run the model some additional spatial datasets needs to be created. Close the SOLWEIG plugin and open UMEP -> Pre-Processor -> Urban geometry -> Sky View Factor. 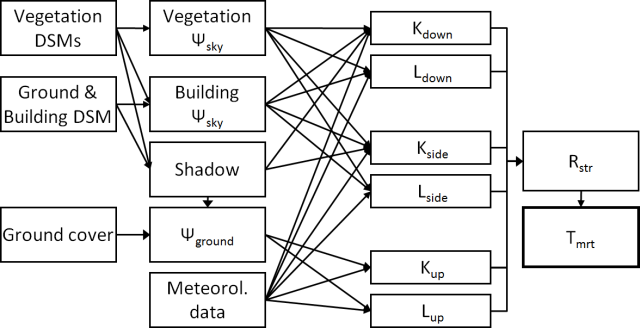 To run SOLWEIG various sky view factor (SVF) maps for both vegetation and buildings must be created (see Lindberg and Grimmond (2011) for details). You can create all SVFs needed (vegetation and buildings) at the same time. Use the settings as shown below. Use an appropriate output folder for your computer. Fig. 46 Settings for the SkyViewFactorCalculator. When the calculation is done, map will appear in the map canvas. This is the ‘total’ SVF i.e., including both buildings and vegetation. Examine the dataset. Where are the highest and lowest values found? Look in your output folder and find a zip-file containing all the necessary SVF maps needed to run the SOLWEIG-model. Another preprocessing plugin needed is to create the building wall heights and aspect. Open UMEP -> Pre-Processor -> Urban geometry -> Wall height and aspect and use the settings as shown below. 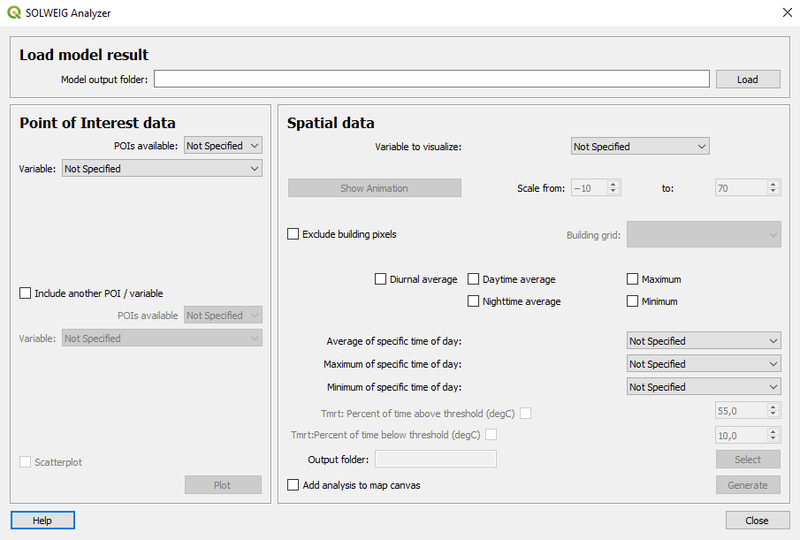 QGIS scales loaded rasters by a cumulative count out approach (98%). As the height and aspect layers are filled with zeros where no wall are present it might appear as there is no walls identified. Rescale your results to see the wall identified (Layer Properties > Style). Fig. 47 Settings for the Wall height and aspect plugin. Re-open the SOLWEIG plugin and use the settings shown below. You will use the GUI to set one point in time (i.e. a summer hour in Gothenburg, Sweden) hence, no input meteorological file is needed for now. No information on vegetation and ground cover is added for this first try. Click Run. Fig. 48 The settings for your first SOLWEIG run (click on image for larger image). Examine the output (Average Tmrt (°C). What is the main driver to the spatial variations in Tmrt? Add 3D vegetation information by ticking in Use vegetation scheme (Lindberg, Grimmond 2011) and add CDSM_Krbig as the Vegetation Canopy DSM. As no TDSM exists we estimate the it by using 25% of the canopy height. Leave the tranmissivity as 3%. Tick in Save generated Trunk Zone DSM (a tif file, TDSM.tif, will be generated in the specified output folder and used in a later section: Climate sensitive planning). Also tick in Save generated building grid as this will be needed later in this tutorial. Leave the other setting as before (Step 4) except for changing your output directory Otherwise, results from your first run will be overwritten. Run the model again and compare the result with your first run. Add your last spatial dataset, the land cover grid by ticking in Use land cover scheme (Lindberg et al. 2016). Run and compare the result again with the previous runs. SOLWEIG is also able to run a continuous dataset of meteorological data. You will make use of a single summer day as well as a winter day for Gothenburg, Sweden. The GUI is also able to derive full model output (all calculated variables) from certain points of interest (POIs). First you need to create a point vector layer to store the POIs. Go to Layer -> Create Layer -> New Shape file. Choose Point as Type and add a new text field called name. Name the new layer POI_Kr.shp. Specify the coordinate system as SWEREF99 12 00 (EPSG: 3007). Now you should add two points within the study area. To add points to the layer it has to be editable and Add Feature should be activated. Two points should be added and the attributes should be id=1 and name=courtyard for the right point and id=2 and name=park for the left point. See figure below for the locations of the two points. When you are finished, save layer edits (box in-between the two marked boxes in Figure 6). Close the editing by pressing Toggle editing (the pencil). Now open the SOLWEIG plugin. Use both the vegetation and land cover schemes as before. This time, tick in Include POI(s), select your point layer and use the ID attribute as ID field. 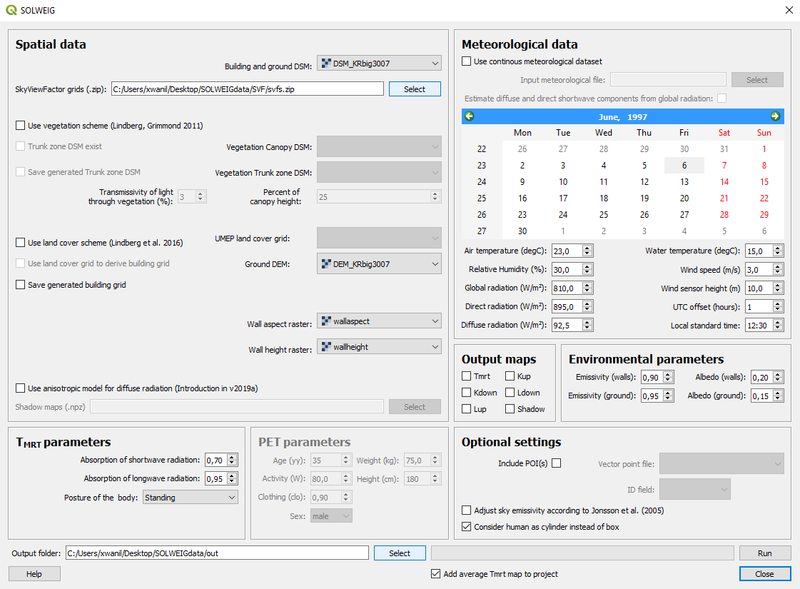 Tick in Use continuous meteorological dataset and choose gbg19970606_2015a.txt as Input meteorological file. Also, tick in to save Tmrt as Output maps. Run the model again. To perform a first set of analysis of your result you can make use of the SOLWEIG Analyzer plug-in. Open the Analyzer located in UMEP -> Post-Processor -> Outdoor Thermal Comfort -> SOLWEIG Analyzer. Here you can analyze both data from your POIs as well as perform statistical analysis based on saved output maps. Start by locating your output folder in the top section (Load Model Result). Firstly you will compare differences in Tmrt for the two locations (courtyard and park). This can done using the left frame (Point of Interest data). Specify courtyard as POI and Mean Radiant Temperature in the two top scroll down lists. Then tick in Include another POI/variable and chose park and Mean Radiant Temperature below. Click Plot. What explains the differences? Now lets us move on to analyse the output maps generated from our last model run. In the right frame, specify Mean Radiant Temperature as Variable to visualize. Start by clicking Show Animation. Now the output maps of Tmrt generated before are displayed in a sequence. Vegetation is one effective measure to reduce areas prone to heat related health issues. In this section you make use of the Tree Generator plugin to see the effect of adding more vegetation into our study area. The municipality in Gothenburg have identified a “hot spot” south of the german church and they want to see the effect of planting three new trees in that area. 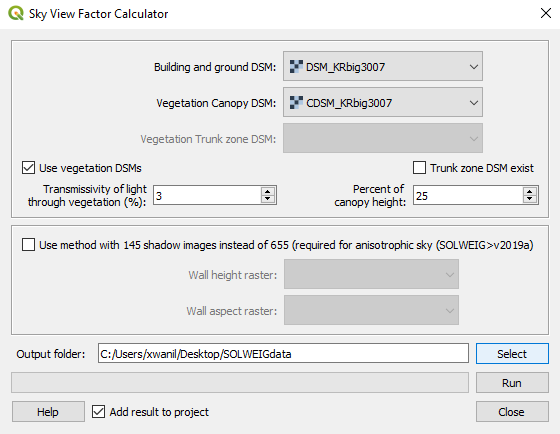 The Tree Generator plugin make use of a point vector file including the necessary attributes to generate/add/remove vegetation suitable for either mean radiant temperature modelling with SOLWEIG or urban energy balance modelling with SUEWS. Create a point vector shape file named (TreesKR.shp) as described in the previous section adding five attributes (id, ttype, trunk, totheight, diameter). The attributes should all be decimal (float) numbers (see table below). 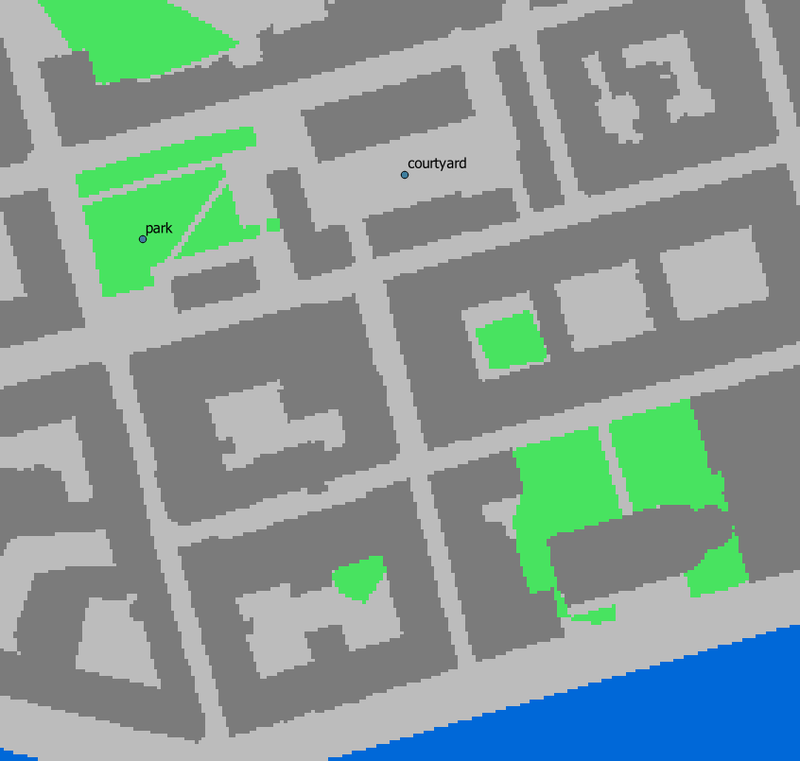 The location of the three new trees are shown in figure below. The values for all three vegetation units should be ttype=2, trunk=4, totheight=15, diameter=10. Fig. 52 Location of the three new vegetation units. Add your created trunk zone dsm (TDSM.tif) that was created previously (located in your output directory). Open the TreeGenerator (UMEP -> PreProcessor -> TreeGenerator) and use the settings as shown in figure below. As the vegetation DSMs have been changed, the SVFs has to be recalculated. This time use the two generated vegetation DSMs. Now re-run SOLWEIG using the same settings as before but now use the new vegetation surface models as well as the new SVFs generated in the previous step. Generate a new, updated threshold map based on the new results and compare the differences. The table below show the input variables needed for each tree point. To remove vegetation set ttype = 0.
trunk Trunk zone height (m agl) Height of the trunk zone.